Ancient Stones - Borders - 051 Standing Stone, Cambridge, Lauder. 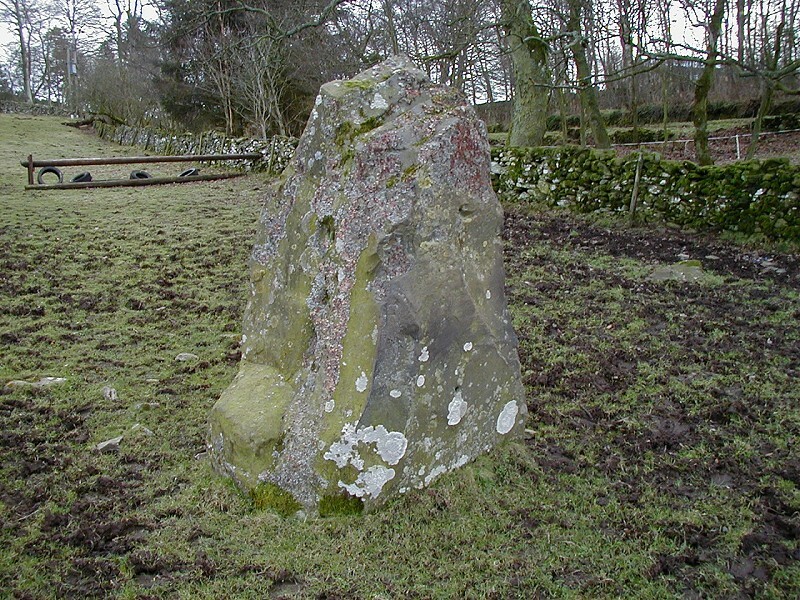 This large standing stone can be seen in a slight hollow and measures 1.8m high by 1.2m by 1.0m. The west face has two drilled holes one above the other, as if for a hinge or similar fitment. From the A697 Lauder to Greenlaw road, turn north onto a minor road at Dod Mill and park in the picnic area. The stone is located in the field beyond the trees to the north of the stone archway. Off-road picnic area at road junction. This standing stone gives little away as to it's original purpose. It's position beside the road, which is likely to have been there since ancient times may indicate the stone to be a marker stone. 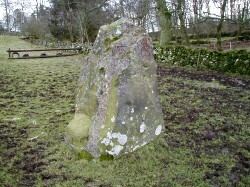 At Bruntaburn Mill, a mile or so to the north east, another standing stone (010) can be seen and 052 Dod's Corse Stone can be found about a mile to the south. All these three stone are near this same trackway and although the latter has been "christianised" is may have originally have been of pagan origin.